This free online educational program contains everything you need to teach various aspects of US History in your Social Studies classroom. You will find videos, photographs, handouts, primary resources and more. What’s even better, these lessons meet your state’s academic standards. 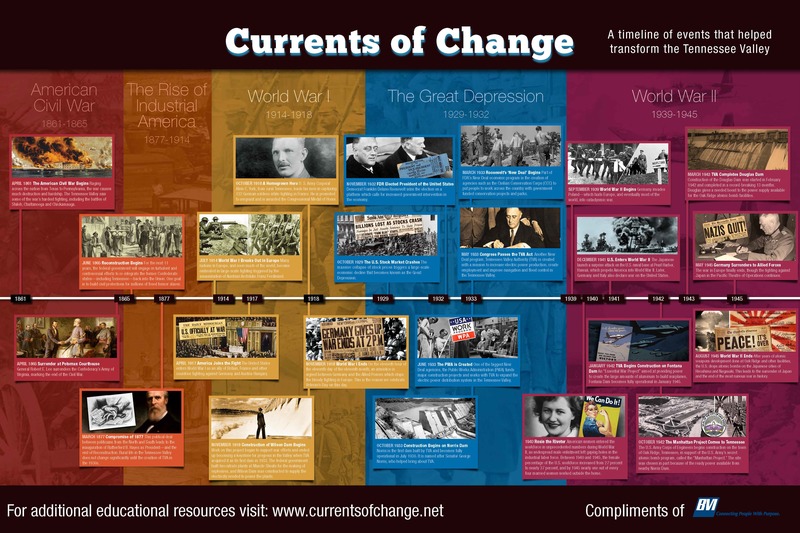 Get a free poster – The Timeline of Historical Events in the Tennessee Valley! If you are a teacher, whether that be private, public or home school, you can receive a Timeline of Historical Events in the Tennessee Valley poster at no charge. Simply fill out the fields below and submit your information to us. If you have any comments, please add those below too. We respect your privacy and take protecting it very seriously. Your information will not be sold or distributed in any way. *Resources are available online. Posters can only be mailed to Teachers in the United States. *By completing this form, I agree to receive correspondence from Currents of Change.